Cementitious materials are an essential part in any radioactive waste disposal facility. Conditioning processes such as cementation are used to convert waste into a stable solid form that is insoluble and will prevent dispersion to the surrounding environment. It is incredibly important to understand the long-term behavior of these materials. This book summarises approaches and current practices in use of cementitious materials for nuclear waste immobilisation. It gives a unique description of the most important aspects of cements as nuclear waste forms: starting with a description of wastes, analyzing the cementitious systems used for immobilization and describing the technologies used, and ending with analysis of cementitious waste forms and their long term behavior in an envisaged disposal environment. Extensive research has been devoted to study the feasibility of using cement or cement based materials in immobilizing and solidifying different radioactive wastes. However, these research results are scattered. 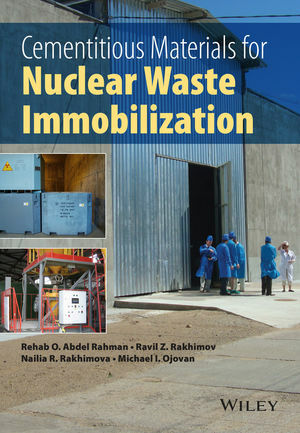 This work provides the reader with both the science and technology of the immobilization process, and the cementitious materials used to immobilize nuclear waste. It summarizes current knowledge in the field, and highlights important areas that need more investigation. The chapters include: Introduction, Portland cement, Alternative cements, Cement characterization and testing, Radioactive waste cementation, Waste cementation technology, Cementitious wasteform durability and performance assessment. Rehab O. Abdel Rahman is Nuclear Engineering Lecturer, at the Atomic Energy Authority of Egypt, Cairo, Egypt. He has been working in the field of nuclear engineering for almost 20 years, and has published in several international journals. His areas of research include radioactive waste management: performance assessment, material selection, cementitious material. Ravil Z. Rakhimov and Nailia R. Rakhimova are Professor and Assistant Professor at Kazan State University of Architecture and Engineering, Russian Federation. Ravil has almost forty years’ experience of teaching in the fields of materials science and cementitious materials. He is the author of more than 35 patents, 29 monographs and textbooks and nearly 600 papers in Russian. Current research interests include building material science and cementitious materials. Nailia has fifteen years’ experience in materials science, and mineral binders. She holds 6 patents, has written one monograph and more than100 papers, mostly in Russian. Michael Ojovan is Assistant Professor at the University of Sheffield, Visiting Professor at Imperial College, London, and Nuclear Engineer at the International Atomic Energy Agency (IAEA), Austria. Prior to this he spent he 20 years at The Moscow Scientific and Industrial Association "Radon", the leading radioactive waste research institution of Russian Federation. He is a Fellow of Russian Academy of Natural Sciences and a Technical Expert of the International Atomic Energy Agency. He has published over 290 peer reviewed scientific papers, 6 books on nuclear materials, 6 book chapters, 14 IAEA documents and has 42 patents. He has also been awarded research grants totalling over £7M.